Behold the future, from the movie adaptation of David Mitchell's acclaimed novel Cloud Atlas. The massive movie — stuffed with a huge A-List cast including Tom Hanks, Hugh Grant, Hugo Weaving, Susan Sarandon, and Halle Berry — jumps across time, with each actor playing different characters in different time periods. It's a massive undertaking that leaps all the way into the future, 2144 Seoul to be precise. 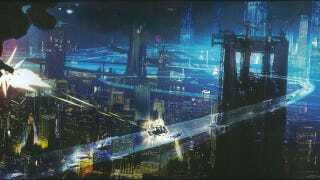 And here is the first ever concept art for the future world of Cloud Atlas. Twitch Film spied a few new pieces of concept art over at Hancinema picturing the dystopian future set in Seoul (which will most likely be popping up in the "6th episode" in the movie — since the picture is rumored to be broken into stories just like the book). We can't be certain if this particular image is also from the future world, but it's certainly channeling both old and new worlds. And finally here is a picture of the actress Bae Doona playing the clone character named Sonmi-451. Cloud Atlas is currently being filmed simultaneously by the The Wachowskis and co-director Tom Tykwer. The hopeful release date is in October of 2012.